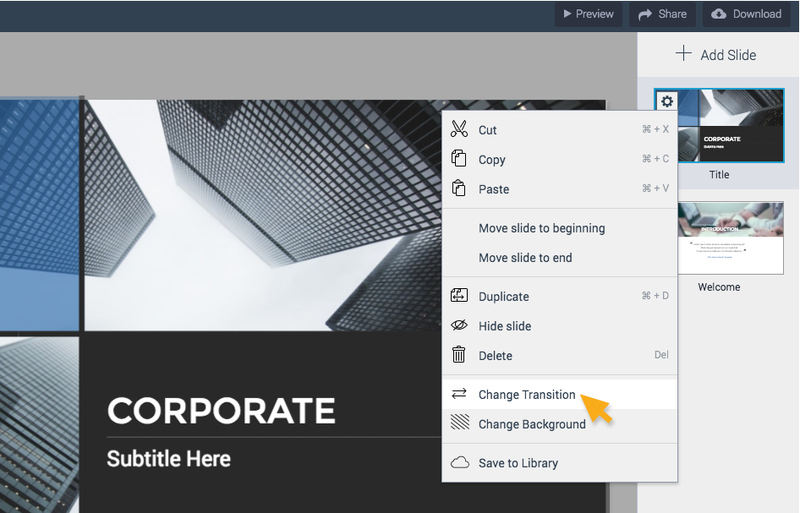 For your presentation, each slide will be assigned a default transition, depending on the template that you have chosen. Visme’s slide transitions allow you to auto-animate your slide decks with captivating, fluid transitions. Our slide transitions automatically applies fluid transitions between slides, based on the coordinates of the objects on your slide with respect to each other. You have options for when your slide advance. You can either based on a set time, when clicked or when video has finished playing if media is present. There are six transition style that you can choose from (see below for the types of transition style) or have no transition at all. Enter from Side – Make the object appear from the left or right on your screen with a fluid and smooth animation effect. Simple/Staggered Fade – Perfect for when you want the objects on your slides to subtly appear one by one on your screen, with a slight delay between each element. Enter from Bottom – Ideal for when you are looking to create a scrolling presentation that looks more like a web page than a slide-based deck. Enter from Top – When you want to switch things up a bit and depart from the typical PowerPoint presentation. If you design your slides in just the right way (by having certain elements such as images, lines or blocks continue from one slide to the next), you should end up with a presentation that looks more like a video than a slide deck. Zoom In – Best option for when you want to create a 3D effect or the illusion that the elements on your slides are zooming into focus. On the right panel, click Slides tab if it is not already open. Select a slide in which you want to change the transition. On the top left of the selected slide, click on the gear icon and select Change Transition in the dropdown menu. 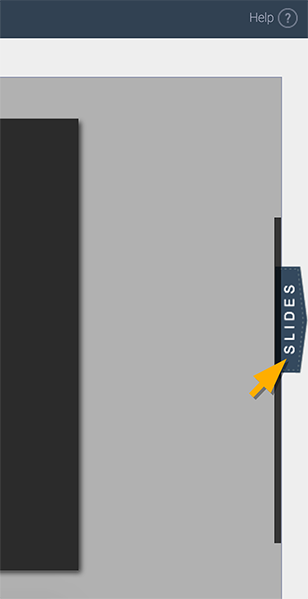 Tip: You would need more than one slide to manage the slide transitions. You will then see a pop up to modify your slide transition. 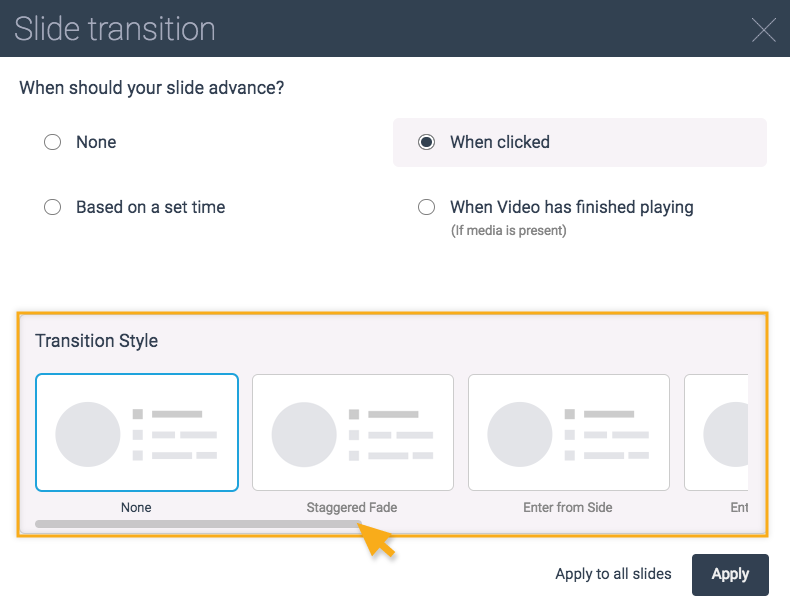 In when should your slide advance option, by selecting When clicked, it means that your slide will automatically transition to the next slide when clicked. You can then choose the type of Transition Style you want to use. To see more transition, use the slider or scroll right using your mouse. 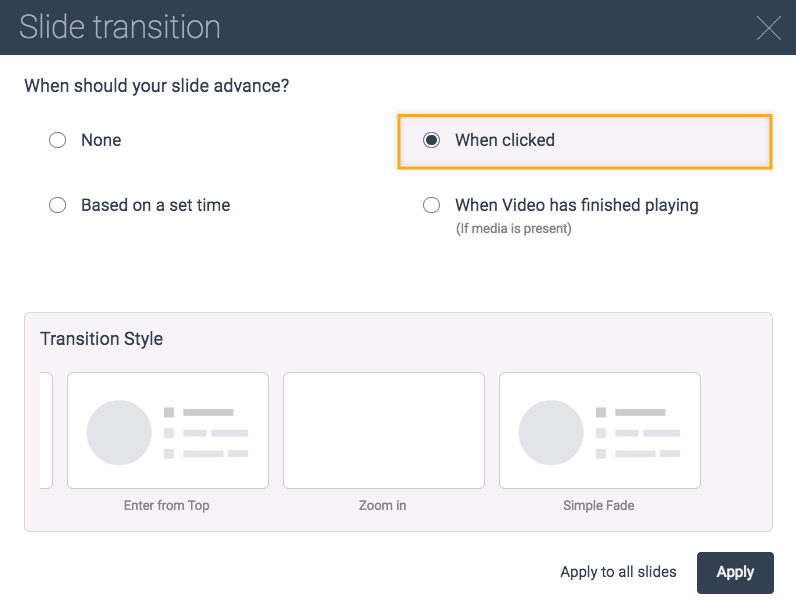 If you want all of your slides to have the same transition, simply click Apply to all slides. You then click Apply once you are done. There are two ways you can change the slide transitions setting. One way is click Share which located on the top right side of your screen. You then click Advanced Settings in the Share Online page. 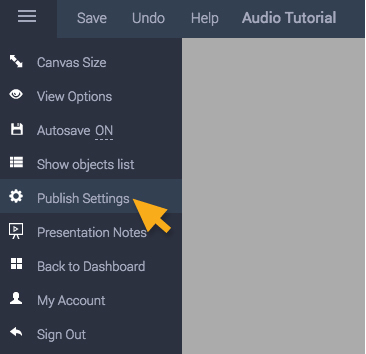 Or click on the Menu icon on the top left of your screen and select Publish Settings in the dropdown menu. Both ways will direct you to Publish Settings. Click on Display Options, you can then set Autoplay animation ON/OFF. You can also customize your slide transitions like setting Loop after ending on/off.